Your phone is a reflection of your personal tastes and preferences. From your lock screen to your sounds, each and every setting reveals a little about how you like to present yourself and interact with your device. The first ever Good Lock application, released in 2016 and compatible with Android 6.0 Marshmallow, introduced users to a frequently-updated array of customizable features for their Galaxy devices. 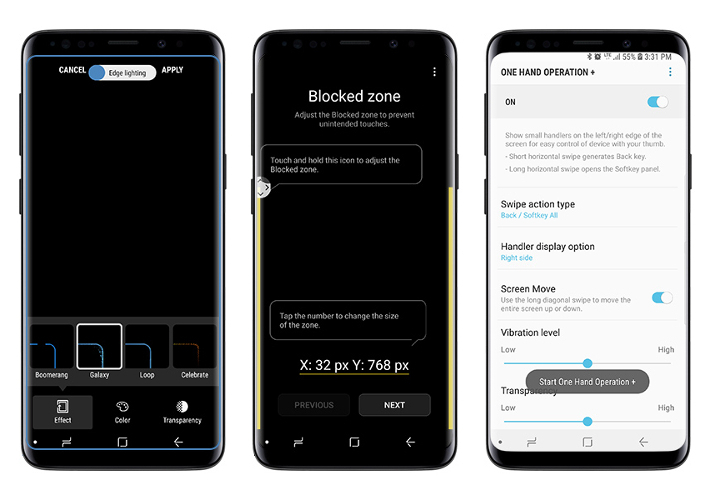 Responding to consumer demand, Samsung has now released Good Lock 2018 to give Android 8.0 Oreo users the freedom to personalize their Galaxy device’s appearance and interface experience. With so many options to choose from, check out the Newsroom’s guide to the features of Good Lock 2018 below. Lockstar is changing how you see your locked phone, allowing you to style your lock screen with a wide range of designs. You can select your preferred background and clock face, as well as which items appear visible on the screen, and these features can be arranged in a variety of configurations. The app also gives you the flexibility to choose the gesture which prompts the phone to unlock and to place shortcuts to apps you use regularly on the lock screen, so the phone will open straight to them after unlocking. Use Quickstar to give your Quick Panel a makeover. With the Coloring tab, you can choose from a list of recommendations or create your own palette by adjusting the hues which mark On or Off for each setting, the color and transparency of the background, and the Blur and Dim effects. 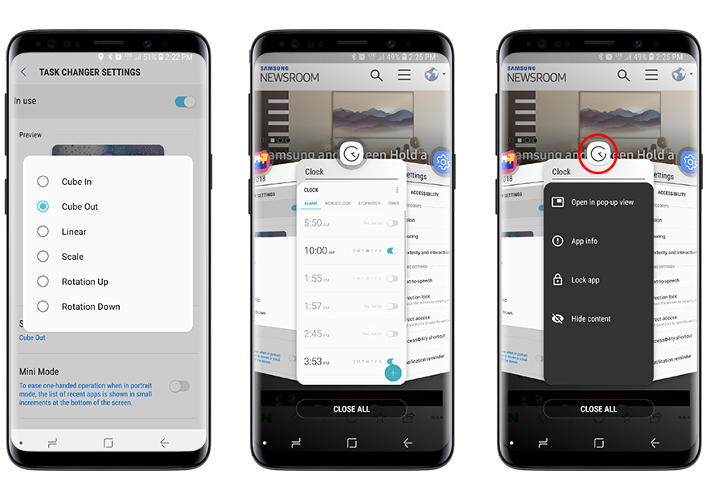 The Simple Indicator tab also gives you increased control over the icons displayed in your Status Bar and the Notification Multi-Window tab allows you to toggle the Notification Multi-Window on and off. With the Notification Multi-Window enabled, you can check the necessary information more conveniently on the pop-up window. The Task Changer app allows you to scroll through recent apps by swiping left and right, rather than up and down, changing the way you move from task to task. There is a choice of Scroll effects and the opportunity to turn on Mini Mode, which shrinks the apps in the bottom of the screen to aid one-handed scrolling. Once Task Changer is enabled, you can pull up the Recently Used Apps and choose to either use the app as a pop-up screen, or split view two apps by holding down the app you would like to use a little harder. Once task changer is enabled, you can also receive more information about the app, lock the app, or hide the app’s contents by tapping the icon image on the top. Using Routines, you can combine processes and functions to create new features. Give each routine a name before selecting the conditions that will prompt the routine and the actions that you want it to perform. To ensure the perfect movie-watching environment, for example, you can set a routine that turns on Wi-Fi, rotates your screen to landscape and adjusts your sound and brightness levels, as soon as you open your chosen media app. 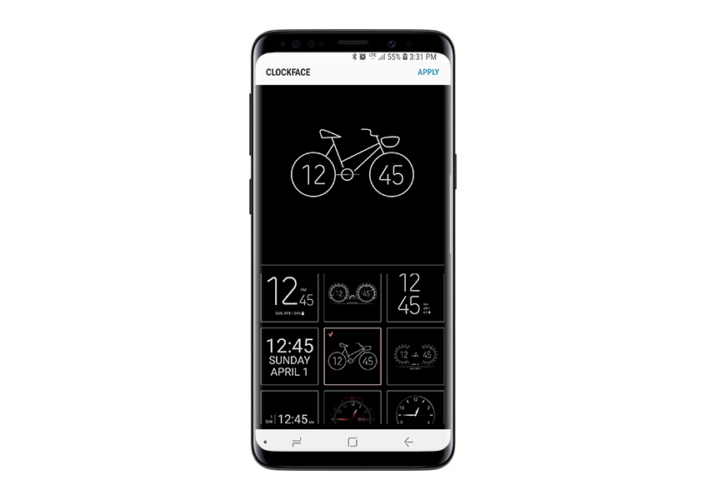 Read the time in a whole new way with ClockFace, an app which allows you to choose from numerous clock designs for your always on display and lock screen. Choices include analog or digital clock faces and there is a spectrum of colors available, including tones which adapt with the color of the background and rainbow effects. 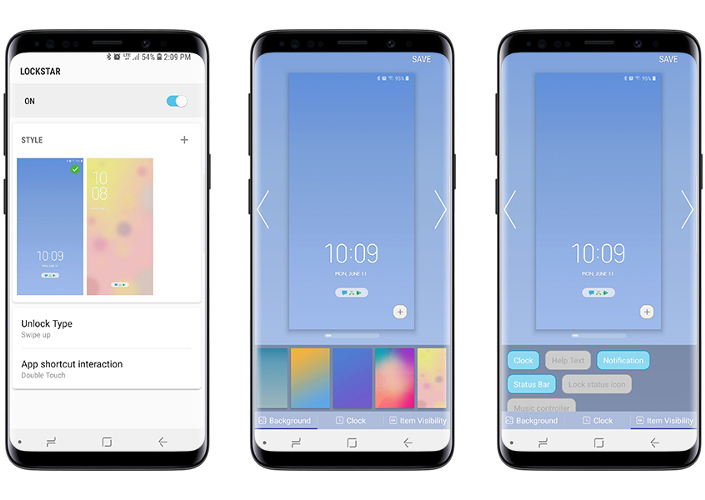 Good Lock 2018 is one member of a family of apps designed to heighten customization on your Galaxy smartphone. For example, EdgeLighting + allows you to tailor Edge Lighting effects to your liking. With Edge Touch, you can establish Edge Zones which do not recognize screen touch to prevent accidental actions. Further adjustable options are offered with One Hand Operation +, designed to help you navigate your device one-handed, with thumb gestures alone. 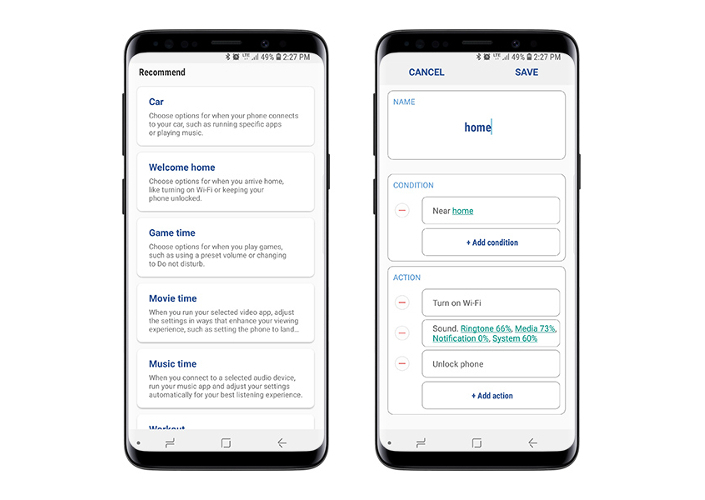 Finally, Sound Assistant gives you even greater control over Sound settings, including the ability to personalize your phone’s sound for different times and manage individual app volume. *Good Lock 2018 is currently available to download from Galaxy Apps in Korea, the United States, UK, Singapore, Australia, and Canada. It is compatible with the Galaxy S9 and S9+, Galaxy S8 and S8+, Galaxy S7 and S7 edge, Galaxy Note8, Galaxy FE and other devices that are running Android 8.0 Oreo and above. Samsung intends to update the app regularly while paying close attention to consumer feedback.